Binh Phuoc (VNA) – Three Taiwanese-funded enterprises on March 21 signed deals to invest a total of 30 million USD at the Minh Hung Sikico industrial park in the southern province of Binh Phuoc. The capital will be channeled into several textiles-fabric dyeing projects spanning 5 ha of the 655 ha park. 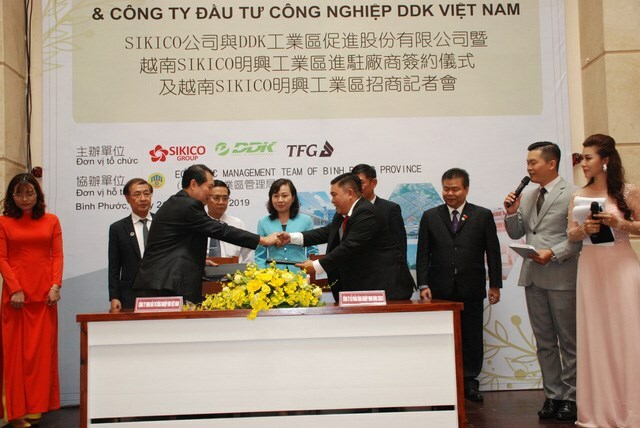 Also at the signing ceremony, the Taiwanese-based industrial investment limited company DDK Vietnam and Minh Hung Sikico Industry JSC inked a cooperation agreement on promoting investment in the park. Speaking at the event, the industrial park’s Deputy General Director Phan Tan Hoang said it will prioritise attracting investments in electroplating, textiles-fabric dyeing, and agricultural mechanics. Investors are required to meet wastewater standards in line with national regulations and give priority to using the local workforce, he added. Chairwoman of the provincial People’s Committee Huynh Thi Hang expected that cooperation from all sides would thrive in the future. Local authorities will create the best conditions possible for investors to operate, she stated.